Mitzvah? No Need to Supersize! The Penn State IFC/Panhellenic Dance Marathon (known as "Thon") is a year-long fundraiser run by Penn State Students. Thon benefits the Four Diamonds Fund which provides money for: cancer research and pediatric patients. The students' efforts culminate with the 46 hour "no sleep" dance marathon which is held in February at the Bryce-Jordan Center at Penn State. Thon has raised over one hundred million dollars since its 1977 inception. It is the largest student-run charitable organization in the world. My son, Ian, is a freshman at Penn State, and he went door to door collecting for Thon in November. Ian discussed Thon at our Thanksgiving celebration, and after he stated that Thon raised over twelve million dollars last year, a family friend exclaimed: "Wow! That is one big mitzvah!" My son said: "You mean twelve million mitzvahs." The friend was confused, but I understood exactly what my son meant. 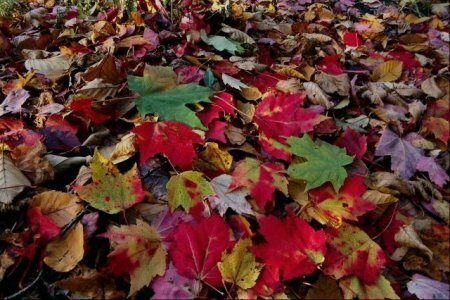 Every family has its stories, and one of our favorites concerns my paternal grandfather, Benjamin Ford, and the "carpet of leaves." Papa Ben was born in Russia. His family was extremely poor, and his mother, Jenny, once wept because they could not afford a rug to cover the worn floorboards in their front living area. My grandfather (who was about eight at the time), knew how much his mother loved the colors of Autumn, and he secretly gathered up hundreds of the most beautiful, golden leaves he could find. He spread them carefully over the floor to cover the shabby spots. His mother came home to find, as she put it, this "magical carpet of leaves." Papa Ben knew that the leaves could not remain on the floor. He and his mother picked them up, put them in a bag and he assumed she would spill them back outside. My grandfather came to this country at the age of nineteen. A cousin gave him a job and a kitchen floor to sleep on. Papa Ben taught himself English and obtained a high school degree. He sent hundreds of small money orders to his now twice-widowed mother in the hopes that she would come to America along with his two younger half-brothers, Joe and Saul. Papa Ben's hopes were finally fulfilled, and as he helped his family settle into an apartment, he found a small drawstring bag filled with what looked like dirt. He jokingly asked his mother, Jenny, if she had brought Russian soil with her so as not to be homesick. Jenny explained that the bag contained remains of the leaves he spread out on the floor all those years ago. My grandfather was shocked. "Why did that mean so much to you? It was just one little mitzvah!" Her response? "This bag is filled with love. There were hundreds of leaves! It wasn't just one mitzvah. It was hundreds." Perhaps this is one of the reasons why the world seems to get ruder with each passing year. Life's pace is too fast and the importance of small kindnesses is grossly overlooked. Not only do our minds clog as we seek out the "supersized" moment, we also over-think when it comes to mitzvahs. We hesitate before doing a mitzvah because we over-analyze what sort of impact it might or might not have. Will our mitzvah be misunderstood, appreciated or considered "perfect" enough? Even a small mitzvah can inspire others to act kindly or lead to something unexpectedly spectacular, but it is not diminished if it remains a stand alone act. Every money order of rubles and kopecks that my grandfather sent to Russia, was a mitzvah in and of itself and need have gone no further to have meaning. Still, he was able to bring his family to America. His brother, Saul, never married and joined the Merchant Marines. His other brother, my Uncle Joe (along with my uncle Abe Shapiro), went on to become one of the founders of Brandeis University. "A person must see himself and the world as equally balanced on two ends of the scale; by doing one good deed, he tips the scale and brings for himself and the entire world redemption and salvation." Maimonides, Laws of Repentance 3:4. Nowhere does Maimonides specify that the good deed must be supersized to "tip the scales." My son understands that the importance of Thon lies not simply in the amount of the final check, but in the willingness of thousands of students, donors and frenetic, exhausted marathon dancers to give at least a small part of themselves. Each individual mitzvah which contributes to Thon is no less important than the end result. What matters most about a mitzvah is that it comes from the heart. It can be small, spontaneous, goofy or out-of-character. The beauty of the mitzvah is that it takes us out of ourselves and connects us with the world; even if it is as simple as a little boy's carpet of leaves.